A crib placed right in front of Panna Dhai Hospital in Udaipur got a premature infant on May 16. The girl weighed 1.25 kg, not even half the weight of a normal newborn. She was admitted to the hospital’s intensive care unit where she was fed mother’s milk. Her health improved within days. Just a day ago, an HIV-positive woman from Lakadvas village had delivered a baby in the hospital. Her family was scared that breastfeeding would infect the child. At the same time, it was dismayed that the infant would be deprived of the nutrition vital for a newborn. She, too, was given mother’s milk. Both the infants, like many others in the hospital, received milk from Divya Mother Milk Bank, opened on April 14 on the hospital premises. The bank was started by Devendra Agrawal, who placed the crib outside the hospital and runs an orphanage in his house, with an initial investment of Rs 20 lakh. Within one-and-a-half months, it has already received 30 mothers. Twenty-six-year-old Rekha Chhaidwal has been travelling five kilometres every day for the past one month in the scorching summer heat to donate milk. “It gives me immense pleasure when I think that needy children benefit from my milk. My husband motivates me to donate. I will continue to do so as long as I can,” she says. Chhaidwal has a four-month-old son and a two-year-old daughter. Twenty-year-old Manisha Ved saw the milk bank when she went to the hospital for her five-month-old daughter’s regular check-up. She was encouraged to donate by her mother who had breastfed her son for up to two years. There are eight such banks in the country, which include four in Mumbai and one each in Pune, Hyderabad and Vadodara. At the Udaipur bank, three staff members process milk from the donors and store it in deep freezer. They first test the blood samples of donors for HIV, Hepatitis B and veneral diseases. The donor then breastfeeds her own child to ensure that she/he does not remain deprived. With the help of a silent electric breast pump, the donor’s milk is collected in a container. Milk of about five donors is mixed to ensure even distribution of all the components. It is then checked for any bacterial growth. Contaminated milk is discarded and the rest is pasteurised and frozen at -20°C. Till May 30, the bank had collected 360 units of milk (one unit equals 30 ml). As many as 168 units have been issued to infants admitted to the hospital. The bank also has provision for donors who wish to breastfeed babies. “Each donor gets a card which entitles her to procure the bank’s milk for any child. They will get milk first in case of shortage. But we hope a crisis never arises,” says Agarwal. But the demand is huge. “The hospital admits around 200 children to its neonatal intensive care unit every month. Many of them do not have their mothers around. One can imagine the requirement countrywide,” says R K Agarwal, former president of Indian Academy of Paediatrics (IAP). According to the World Health Organization (WHO), mother’s milk is critical for infants and young children. It improves nutrition, physical growth and resistance to cope with common childhood illnesses. Children who get mother’s milk have less risk of certain non-communicable diseases and grow up to be better workers, says WHO. 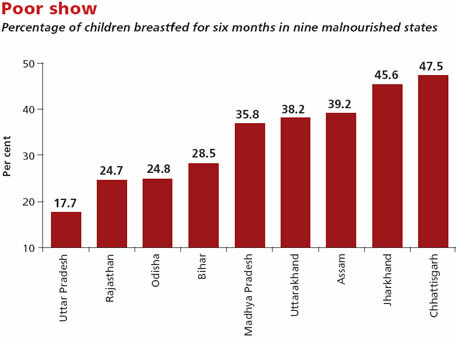 To check malnutrition in the country, non-profit Naandi Foundation conducted a survey in 2011 and found 42 per cent of the country’s children below five years underweight and 59 per cent stunted. Prime Minister Manmohan Singh, who released the report in January 2012, said it was a matter of national shame. According to the 2011 government’s District Level Health Survey only 40.5 per cent children in the country get mother’s milk within one hour of birth. The percentage of children who get mother’s milk for at least six months ranges from 17.7 per cent in Uttar Pradesh to 47.5 per cent in Chhattisgarh, the Annual Health Survey of 2011 states. Despite severe malnutrition among children, India has not prioritised breastfeeding, says Arun Gupta, managing director of Breastfeeding Promotion Network of India. A study conducted in 51 countries to analyse the state of global policies and programmes for infants and young children ranked India 31st. The International Baby Food Action Network (IBFAN) study, done in 2012, states that of the 83 million children born in the 51 countries studied, only 34 million were exclusively breastfed in the first six months as recommended by WHO and Unicef. The only law related to breastfeeding in India is Infant Milk Substitutes, Feeding Bottles and Infant Foods (Regulation of Production, Supply and Distribution) formulated in 1992. It prohibits advertisement of infant milk substitutes. But the government did not take any step for its stringent implementation. Result: private players are openly violating the law. Initiatives such as mother’s milk banks are encouraging, but they will show countrywide effect on children only if they are included in the national policy, says Gupta. In 1990s, Brazil included setting up of mother’s milk banks in its national policy. All district hospitals have such banks. Civic bodies are engaged in the activity. Fire brigade vehicles are used to collect milk from across the country. Now Brazil has brought down its malnutrition level by 73 per cent, he adds. To bring a change in the country’s scenario, the Infant and Young Child Feeding chapter of IAP will meet in Gurgaon on June 30 and discuss the issue, says R K Agarwal. “We will prepare a document focussing on the need of mother’s milk banks and hand it over to the government,” he adds. Great story. Hopefully, more women would donate to this noble cause and more children would be benefited from this and hence malnutrition among them could be checked in the country. This is the Real devotion for the too little ones. Hope it will be replicated in small towns. Bank to which mothers can donate EXCESS breast-milk is welcome as long as the bank distributes it without making profit to those who need. Profit-making sale of donated breast-milk or other business, as has started in UK to make & sell special food-products, is to be avoided strictly. I am sure all the states do meet once in a year with the central Government for funds allocation and during that time they have to take an oath of setting up Milk banks in hospitals well managed by them and supply to the needy. Nice to read about this... Do we need any regulatory approval or license to initiate a Milk Bank in India?